HISTORY was made in the Hilton Hawaiian Village Coral Ballroom last night as the Hawai'i Academy of Recording Arts announced ties in two categories of the 2006 Na Hoku Hanohano Awards. Holunape and Kaumakaiwa Lopaka Kanaka'ole tied for top honors in the Hawaiian Language Performance category, while two teams of recording studio engineers won in the Engineering category. Hapa performed during last night's Na Hoku Hanohano Awards presentation honoring Hawaii's top musicians at the Hilton Hawaiian Village's Coral Ballroom. 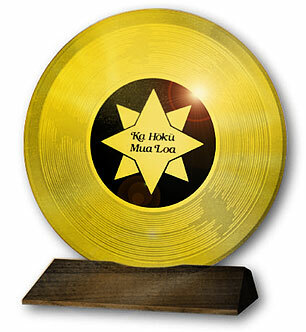 Hapa won Album of the Year with its CD "Maui." Wendell Ching and Tommy Hall, who received Hokus for their work on Hapa's album "Maui," shared the category with Gaylord Holomalia and Kapono Beamer, who had engineering duties on Beamer's Grammy Award-nominated "Slack Key Dreams of the Ponomoe." "For me it's a tremendous sense of gratification," Beamer said. "I really do pay a lot of attention to the production process. The more CDs that I have done, the more time I want to take. It's a tremendous honor to be honored by your peers, so it's a real thrill for me." Ching said, "It feels so wonderful to win one, and thanks to everyone for voting for me." Beamer was one of three 2006 Hawaii Grammy finalists to win last night. Ledward Ka'apana, also nominated for a Hawaiian Music Album Grammy, took top honors in the instrumental category with "Ki Ho'alu: Hawaiian Slack Key." Jack Johnson won in the Rock Album category, and also Song of the Year for "Good People." Jack Johnson, left, shook hands with artist O-Shen after winning Rock Album of the Year for "In Between Dreams." LOS ANGELES-based musician/record producer Daniel Ho, a producer of this year's Grammy-winning slack-key compilation, added another Hoku to his collection when "Hymns of Hawai'i, Vol. 2," which he recorded with slack-key master George Kahumoku Jr., won the Religious Album category. The win was deja vu for Kahumoku and Ho -- an earlier collaboration, "Hymns of Hawaii," won in the same category in 2000. Last night was also a big one for Nathan Aweau, who won two awards -- Male Vocalist of the Year and Jazz Album of the Year -- as a solo artist, and two more as a member of the new Hapa with Barry Flanagan. 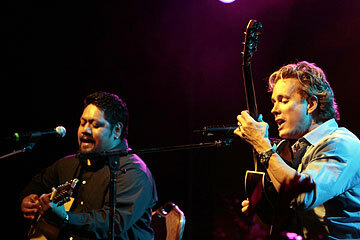 Aweau and Flanagan won Contemporary Hawaiian Album and Album of the Year for their breakthrough album "Maui." Flanagan, a founding member of the original Hapa with Keli'i Kaneali'i* in the early 1990s, shared another Hoku with Solomon Enos and Scott Johnson when the album won in the Graphics category. George Na'ope, above center, was honored with a lifetime achievement award during last night's Na Hoku Hanohano Awards. Flanagan said, "The man upstairs is responsible for all of this, so we thank him for this award." "My main instrument has always been the bass guitar, and this (album) is something that has been on the back burner for a long time," Aweau said. Aweau's success was as close as any artist came to "sweeping" the awards. Perennially popular Jake Shimabukuro won Favorite Entertainer but lost to Johnson for Rock Album. Aweau beat Johnson for Male Vocalist, but Hapa lost to Holunape for Group of the Year, even as Holunape lost to Aaron J. Sala in the Most Promising Artist category. "I'm just glad to be here," Shimabukuro said, "because last year, I was out of town. The performance at the Hokus is the one I get most nervous about every year." 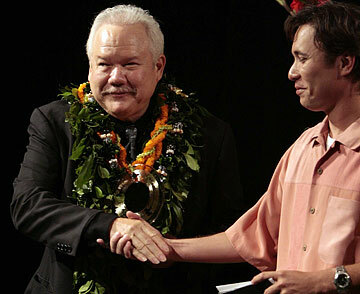 Kapono Beamer, left, accepted the 2006 Ki Ho'alu Award from Justin Cruz. JERRY SANTOS, who won the Moe Keale "Aloha Is" Award for Community Service, said Keale had taught him that "taking the time to care about the people around us is a good thing." Graphics was one of seven awards announced before the start of the televised show, while the audience was concentrating on dinner. The recipients of the 2006 Bill Murata Memorial Scholarships were also introduced while the crowd was eating. Repeating screenings of biographical videos first shown at the Hawai'i Academy of Recording Arts' 2006 Lifetime Achievement Awards Show in March, and 12 lengthy live performances by a mixed bag of Hoku nominees and previous winners, helped extend the running time of the televised awards show. » Keili'i Kaneali'i was a founding member of Hapa. An article on Page A6 on Thursday about the Na Hoku Hanohano Awards misspelled his last name. Also, the winner in the Haku Mele category was "Ehuehu Mai Nei 'O Mänoa," written by Kihei de Silva. The title was misspelled in the awards list on Page D5.